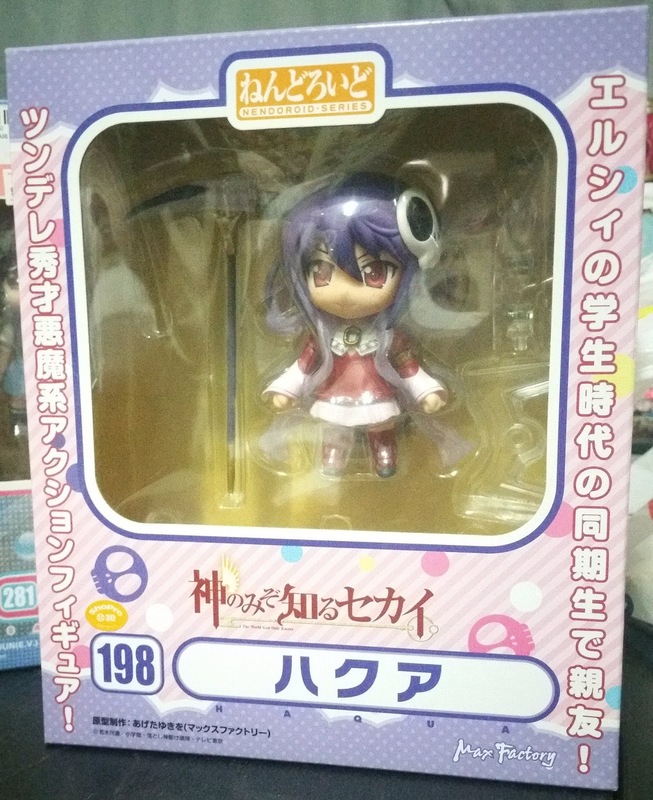 Haqua from Kami Nomi Shiru zo Sekai is another old-version Nendoroid which I picked up. 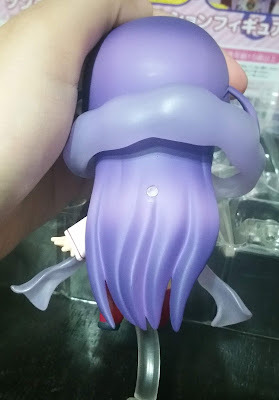 As with most of these older Nendoroids, their neckplates do not match up entirely with the newer ones so be sure to take note of this if you are planning to use her parts with other newer Nendoroids. Being an older Nendoroid, her box follows a very different design from the newer ones and actually has their own backgrounds. She comes with a mass of purple and pink with slight yellow accents, which matches her purple color scheme and feminine charm. 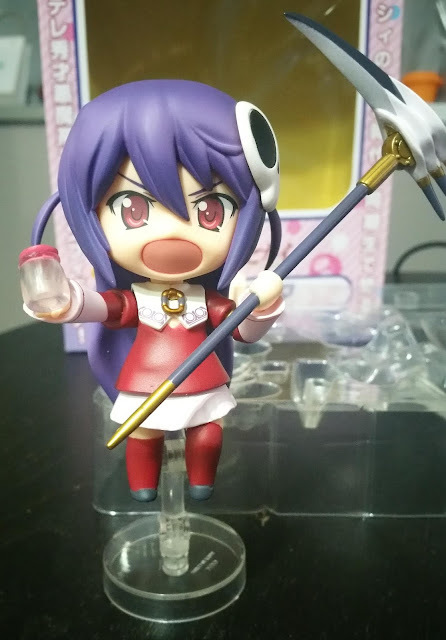 Haqua doesn't come with many accessories that can be matched with other Nendoroids, but has her two most important ones: her scythe and a special detention bottle! She also has three different faceplates that give the Nendoroid a very good variation in expressions as well as showcase her different sides (blushing and embarrassed, and angry sides). Her base is not the same as the usual square Nendoroid base and this smaller base makes her much more compact and easier to display among your other figures. The side ponytails sticking out are connected by pegs so you can twist and turn them to match the direction you want to use when posing her. 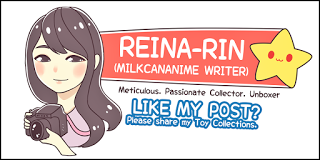 Also, her outfit comprises mainly of red and white and a lot of frills at her collar, and the ruffles are very delicately sculpted and painted. On the flipside, there isn't much shading and creases around her outfit. The blush on her cheeks for this faceplate doesn't show well on camera but it definitely can pass as a cute flustered expression even when matched with other Nendoroids. As this was a second hand Nendoroid from Mandarake, she actually came with a damaged part. There is a broken peg in the peghole on the back of her hair. This peghole is used to insert a part to hold up her raiment. Thankfully, even without the peg in place, the raiment is still able to be held up simply by placing it in the space between her arms and body. The other faceplate looks very cute alone, but the mouth seems a tad too huge when you fit it with the Nendoroid. In this new pose, I have Haqua in the air, holding a special detention jar. The scythe is also accurate to the design and can be balanced even when she holds it with a single hand. 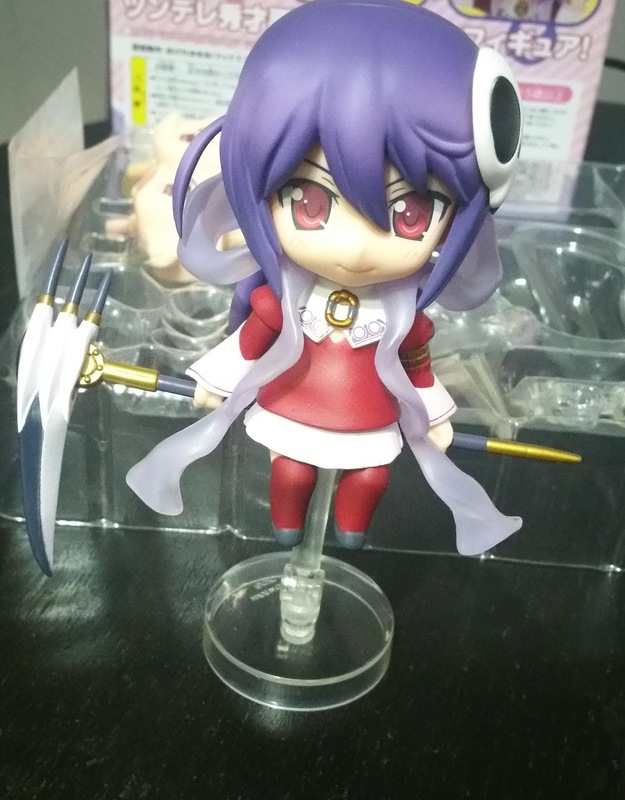 Another way to pose Haqua with the scythe would be her sitting on it, and this is also the most difficult pose to put her into since you have to space her hands apart wide enough so as to keep her shoulders in place. 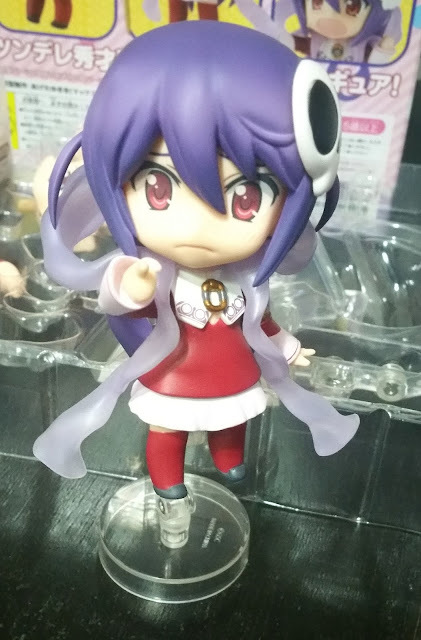 Unless you are a diehard fan of Haqua or the series, this isn't a Nendoroid that I would recommend getting due to the difficulty in placing her into some of her more memorable poses. The number of accessories that comes with her is also limited and wouldn't mesh well with other Nendoroids that are not of the same series. 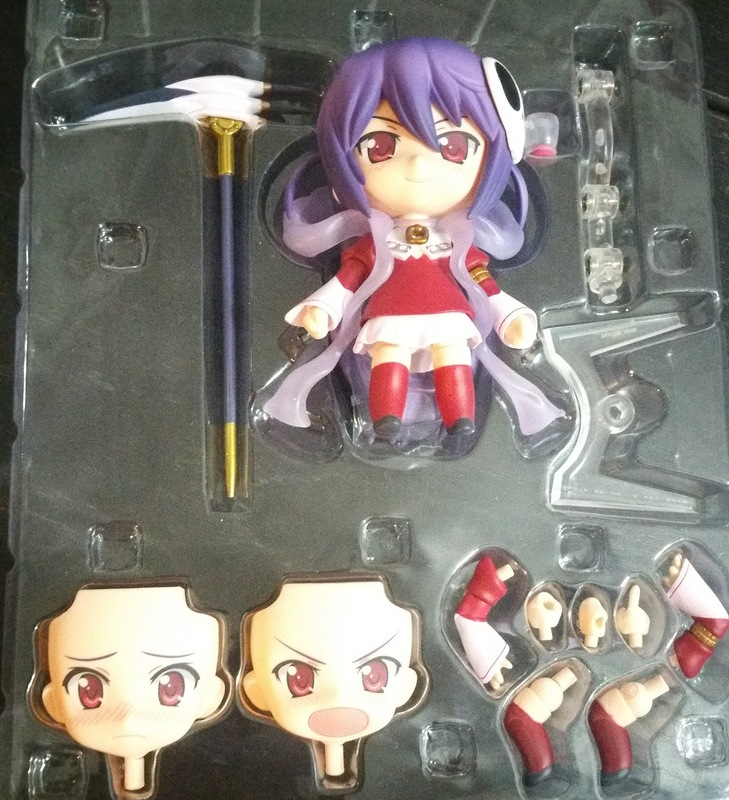 No Comment to " Figure Unboxing and Review: Nendoroid Haqua (The World God Only Knows) "